It’s about to get crunchy up in hur…so bear with me. Don’t worry, I promise not to show actual pictures. I know you’re probably thinking, ‘Please tell me you’re not about to talk about eating your placenta, are you?’ ‘That’s disgusting!’ I know, I know, I was there just a short while ago, but I have since seen the light. Before you leave me high and dry, let’s talk about why people would even remotely consider consuming their placentas (and the different methods of doing so). I hate to break it to you, but it is quite common in many countries around the world to consume, freeze, and even bury your placenta–it was a living and beneficial organ at one point. I know there are some big words in there, but several of these are very important and beneficial to a new mama. I know if I was hemorrhaging at home, I would definitely have no qualms about sticking a piece of placenta between my tongue and cheek, if that meant skipping a trip to the hospital. Also, the fact that giving birth and the few weeks afterwards can be traumatic for some makes me not mind having something from my body help get me through it. Decrease in baby blues and postpartum depression, resulting in better bonding with baby. Increase in and enriched breast milk, offering the very best nutritional value to a new baby. Increase in energy, which is not only welcomed, but necessary with a newborn. Decrease in lochia, postpartum bleeding, which is also a benefit for a new mother. Increase in iron and other essential vitamins and minerals that are lacking after the birth of a baby. Decrease in sleep disorders, another welcome thought for a mother responsible for late night feedings. I don’t know about you, but it sounds appealing-especially if you need help in the breast milk department. Also, the fact that I probably went through some depression with Emma (from having a C-section), I would have gladly taken any natural help I could get. The crazy thing is you don’t have to consume it all at once. You can save it for menopause, to balance hormones, later in life and even give it to family. My midwife assistant said I could give my placenta to my mom or even Emma. Apparently, it is also a good salve when little ones get a cut or can even help calm stressed out kids (and husbands) with just a few drops from a tincture. Raw Consumption-To maintain the raw form of the placenta and continue to get the most out of it, you can cut your washed placenta into dime sized pieces and place on wax paper, seal in a freezer bag and place in freezer. Dosage: 2-4 pieces daily are all that is needed and can be eaten alone or even blended in a smoothie. Encapsulation-Encapsulation consists of drying out and grinding your placenta and then placing it into soluble, empty vitamin capsules so that you can simply swallow just as you do with any other vitamin or pill. Encapsulation is currently the most popular method of consumption in the U.S. 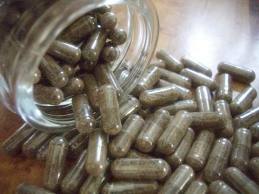 Dosage: 2-4 capsules daily for the first few weeks, then slowly reduce dosage as desired. 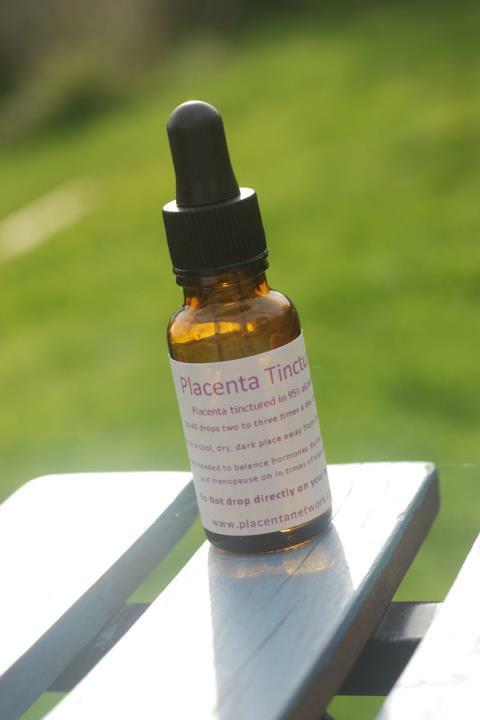 Placental Tinctures-Tinctures offer a way to maintain placental benefits for long periods of time. They should be stored out of direct sunlight. Just a dropper full or two can be added to your herbal tea or warm water. They are great to use during menopause to help maintain a balance of hormones. Dosage: 1-2 droppers full in tea or warm water, or directly under tongue, 1-2 times a day or simply as desired. After talking with the midwife assistant, who will do the encapsulation, I decided to go with 1 tincture and get the rest encapsulated. Does all this mean I’m giddy to see my placenta? Definitely not! And I’m pretty sure Josh wants nothing to hear about what will be happening to my placenta, but like a supportive hubby, he’s going along with it. I figure it can’t hurt me to try a few methods to help my body out along with the bond with baby, so I’m giving it a shot. In regards to cost, it can run you from $125-$300 depending on what you have done. Look into it if you’re interested. I know this topic is pretty crunchy (much like the DivaCup and Squatty Potty), but I figure it’s worth getting the information out there for those who may be considering the process. For all I know, you could want nothing to do with that bloody organ and that’s cool, too. This is just another part of my crazy crunchy journey…next up would be a Lotus birth! Has anyone out there done this or are you considering it? Note: Photos from here, here, and here. I absolutely had to delete this from my in box. But overall I enjoy the information you pass on. Please no more on the placenta. I did the raw encapsulation method and feel like it really improved the post-partum experience I had with my second as compared to my first child. Really, even if it’s a placebo effect it can’t hurt anything! 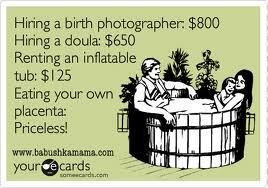 Plus I think the benefits are pretty well documented. Go for it! I really loved reading this article…. Until the end where you said “at least I’m not doing a lotus birth” that rubbed me the wrong way. Not a nice way to finish an informative and natural blog post. You have a point. I think I was so surprised by it, and had never heard of it, that I thought it was extreme crunchy. I’m definitely going to get my placenta encapsulated next time. Anything that might help level off those crazy postpartum hormones is worth a try, in my opinion.